Cosmetics may be defined as “substances that you put on your face or body that are intended to improve your appearance”. The desire to improve one’s appearance is something that seems to be inherently human, and can be done in a number of ways. It is known today, for instance, that during Pre-historic times, ornaments such as necklaces and bracelets were used, as they have been found as grave goods in burials from that period. Another way of improving oneself is of course the application of cosmetics. This article will focus primarily on ancient Egypt, where cosmetics are thought to have been first used. Nevertheless, the use of cosmetics in other parts of the ancient world will also be looked at briefly. The earliest known evidence for the use of cosmetics by human beings is believed to come from the ancient Egyptian civilization. 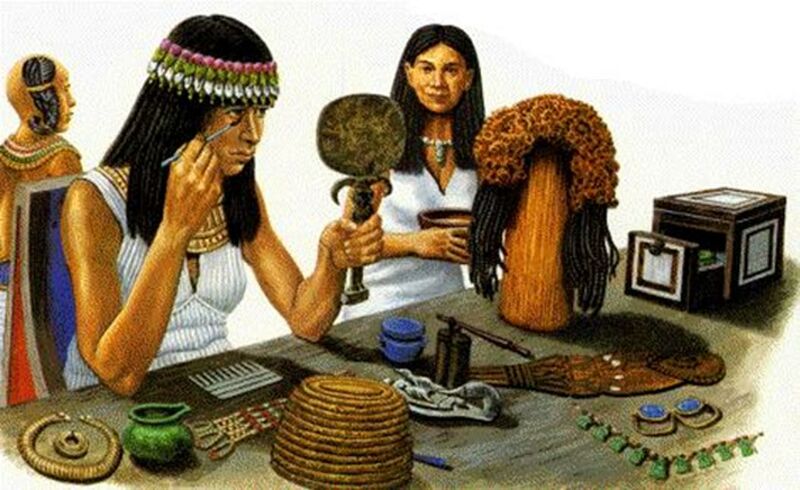 Thus, it has commonly been speculated that cosmetics were first used in ancient Egypt (others have suggested that red ochre is evidence that the use of cosmetics began much earlier, i.e. during the African Middle Stone Age). Some sources say that the earliest evidence available for the application of cosmetics by the ancient Egyptians comes from 10000 BC (around the Neolithic period). During this period, it is asserted, the healing abilities of scented oil was discovered. These oils were used by the ancient Egyptians “to clean and soften their skin and mask body odor”, as well as for protection against the hot air. Vessels used for storing the oils have indeed been found, though the best known of these are perhaps from the Pharaonic period. The ancient Egyptians were also famous for their use of kohl, which was made of “a mixture of metal, lead, copper, ash and burnt almonds”. This substance was applied to the eyes using a small stick. Kohl was usually applied onto both the upper and lower eyelids. Additionally, a line extending from the corner of eye to the side of the face was also drawn with kohl. In addition to its perceived magical protective powers, kohl also helped the ancient Egyptians to deflect the harsh desert sun. Furthermore, recent scientific research has shown that the kohl killed off harmful bacteria, thus protecting the ancient Egyptians from infectious eye diseases. It should be pointed out, however, that the lead in the kohl might have been harmful to the body. In ancient Egypt cosmetics was used not only by women, but also by men. 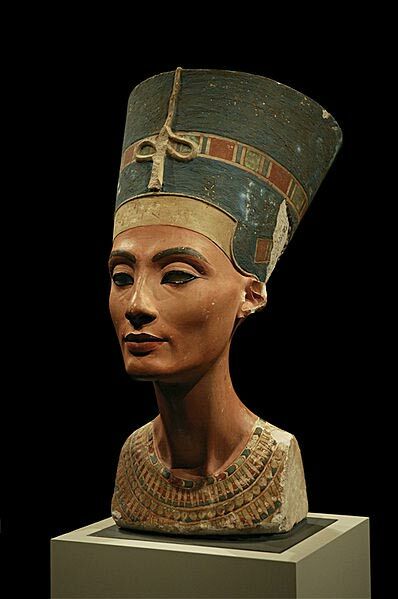 Additionally, cosmetics were used not just by certain social classes, but by the whole of ancient Egyptian society. In a way, cosmetics went beyond the need to improve one’s appearance, and turned into an essential part of life. For example, for those who could afford it, there were professional cosmeticians, the ‘face painters’, for hire. Thus, for these “face painters”, cosmetics was a means to earn a living. The importance of cosmetics as part and parcel of life extends even into the afterlife. When one comes before the gods during the ‘Judgment of the Dead’, one has to make the right impression by wearing the appropriate clothing, and putting on the right make-up. Whilst such cosmetics as scented oils and kohl were being used in ancient Egypt, other types of cosmetics were being used in different parts of the ancient world. In ancient China, for instance, people began to stain their fingernails with a mixture of gum arabic, gelatin, beeswax and egg around 3000 BC. Unlike the ancient Egyptians, this practice served to differentiate the various social classes. 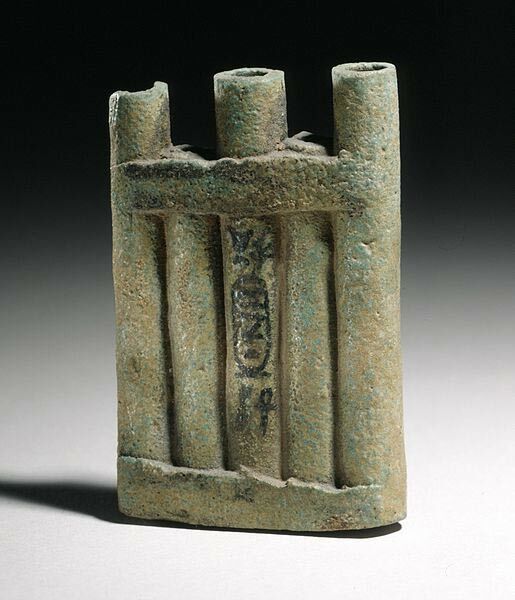 During the Zhou Dynasty, for instance, the fingernails of royals were stained gold and silver. Lower classes, on the other hand, were not allowed to use bright colors to stain their nails. Another cosmetic practice used by the ancient Chinese was the use of rice powder to paint their faces white. The desire for a fairer complexion, however, was not limited to the Chinese. The ancient Japanese and the ancient Greeks too are said to have had painted their faces white. Whilst the former used rice powder, the latter used white lead. To a certain extent, this reveals the traits that people of these societies regarded as desirable and beautiful. Lastly, cosmetics have been used in more unconventional ways. When one says that cosmetics may be applied to improve one’s image, one may ask “For what occasion?” In the previous examples, cosmetics was applied in everyday, mundane situations, or during social situations in which one has to make an impression. If the Britons used pieces of wood to die themselves they would have been black and blue. There were "Black Irish." In their case blue would be the only noticeable result of using shillelaghes for cosmetics. The Britons dyed themselves blue with WOAD - not "wood". So in the above I noticed the sticking catalyst was eggs or oil. I know that both oil and eggs can be used with other pigments to make artistic paint for canvasas. Something that I am wondering is, during the paleolithic stage of hummanity cave walls were painted using charcoal and dirt pigments. Was this ever used a makeup for more primitave peoples? 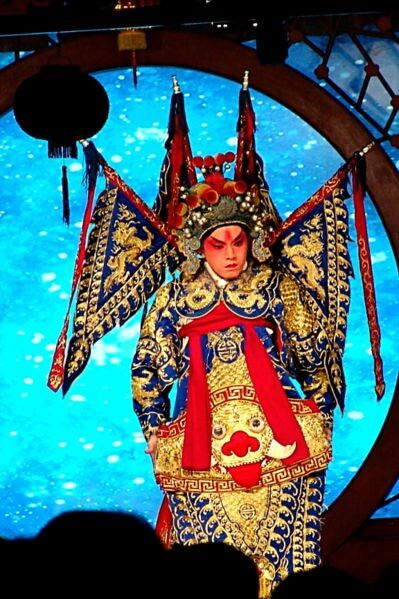 The Chinese invention of gunpowder started off as a cosmetic application to 'beautify the facial skin'. I have often wondered whom was applying this mixture to the skin and just 'how' was it discovered to blow up'. Talk about a sudden surprise?